Street Legal Performance looks to the past in delivering their latest Camaro project. Veteran New Jersey-based GM tuning specialist Street Legal Performance, better-known as SLP, has delivered a novel Camaro package dubbed the "Panther," a name Chevy used for a project to rival the Mustang in 1965 before finally going with the name Camaro. Painted all black, 100 Panther Camaros will be available as a supercharged 6.2-liter 560-, 585- and 600-hp models, while 45 will come in 700-hp form. SLP claims the Panther 600 can sprint from 0-60mph in around 3.5 seconds. All that extra power comes courtesy of a Magna Charge TVS 2300 supercharger package aided by high-lift rocker arms, titanium retainers and springs. There&apos;s also an SLP Blackwing cold-air induction system and an axle-back Loud Mouth II exhaust system. An upgraded spring package lowers the ride height by an inch, while various suspension upgrades are also available, such as a coilover spring/shock package. Naturally the Panther&apos;s looks are just as important as its bite, so SLP added a new fascia, hood & trunk graphics, side-grill inserts, a rear spoiler, and Panther-logo mats and headrests. Added extras include 20-inch black-chrome wheels, a front splitter, rear diffuser, and Brembo upgrade packages. 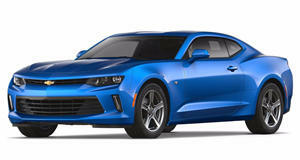 The base price for the 2012 SLP Chevy Camaro Panther 600 is $57,000, which includes a $32,000 1SS donor car. The 700hp Panther Base package comes in at $64,995.